A good longtime friend reminded me recently of all the music we listened to in highschool while driving back country roads home at too fast speeds (and more than likely trying to beat the train). I guess I was often the go-to to for music in those days, and thanks to me thinking my big brother was pretty cool, I swung our listening preferences to the heavy-metal-and-lots-of-it-really-loud most of the time. Prior to that I was a big fan of Britney and all her friends, and now to this day I’ll listen to just about anything if I consider it music but have had We Are Messengers and The Digital Age on repeat for most of the last year. They’re basically my preferred pre-trail run jam. Oh and Britney. Because she knows how to motivate a girl through a Friday afternoon strength session when nothing else will. In other ramblings, lately I’m into making weeknight meals a little more time-intensive and switching weekends to simple, easy, and quick. I was accused recently of reverting strongly to my Irish/British roots when it comes to my choice of quick, convenient comfort food since I always end up with some version of beans on toast. I let my tomato plants grow a couple weeks longer than planned and the result is this recent favorite. Inspired by Joshua McFadden’s Six Seasons, it has spiced-rubbed tomatoes, basil/walnut pesto, and quick chickpeas tossed with parsley and balsamic, all on top the gluten-free sourdough I’ve been working on all summer. (Each successive loaf is turning out nicer and nicer and it makes me so so excited)! I’ve been getting a lot of questions lately about quick and simple meals, and some version of this is definitely my go-to. I usually have cooked chickpeas or other beans in the fridge ready to go, pesto in the freezer, and when I’m super lucky, fresh bread (or frozen) to round it out. When I’m feeling extra lazy // need a decent meal quick, pesto on toast with a fried egg and quick pesto-dressing tossed greens also does the trick. Mix the sumac, coriander, cumin, red pepper flakes, 1/2 tsp. salt, a pinch of black pepper, and the garlic in a little dish. Slice the tomatoes and lay out on a flat baking pan or plate. Rub the spice mixture all over them and let them sit while you prep the rest, and up to an hour. In another small bowl, toss together the chickpeas, vinegar, and minced herbs. Season lightly with salt and black pepper, taste and adjust the seasoning. To serve, toast the bread, warm the pesto, and then top the toast with pesto, tomato slices, and the chickpeas. As an undergraduate living in a house with three other friends, we often cooked and ate meals together. Often, that meant I cooked and shared a lot. Many of the recipes were a little too inventive, had mishaps, or were otherwise freely critiqued with a good dose of humor all around. One such meal happened to be lentil tacos. I long-ago picked up the recipe from Runner’s World, back when they had a fairly elaborate recipe database on their site. The tacos were good but they were also what I deemed gringo-hippy tacos with their reliance on all the common gringo taco accompaniments, shredded cheese, lettuce, flour tortillas, etc. And the filling. It had not only lentils but also raisins, and they both finished simmering in salsa. Not exactly authentic or normal. Exactly the type of thing I would make. And still do. The particular day I made these at that house, my roommate had a friend over who stayed for dinner. She was/is a good friend from childhood, a friend I had grown up eating countless authentic tacos with in our hometown. He was not only from Mexico, but also knew food. I was so embarrassed. I would never intentionally serve my hippy tacos to someone who knows tacos. (I had by then switched over to corn tortillas and dropped the gringo accompaniments). But still. We all dived in and the lentil filling was met with overwhelming approval. And then I mostly forgot about the recipe, only making it a handful of times in the years since. In my hometown again over Christmas, my friend brought up that memory and asked for the recipe. Really? That’s just an old Runner’s World recipe. But when I looked, it was gone from the site. Good thing I had printed and held on to it, as I did then for all the really good recipes. So here it is, slightly adapted from the original, still in all its inauthentic-ness. We served them this time over locally made corn tortillas and topped off with shredded carrots, diced red cabbage, and kohlrabi matchsticks, because they’re in season and were already on hand. That tends to be how we eat tacos. 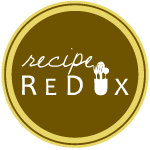 The Recipe Redux theme this month is Taco Tuesday and we were challenged to share our healthy, creative take on tacos. What is yours? I’d love to know how you enjoy them! In a large skillet, warm the oil over medium-high. Add the onion and celery and cook for five minutes until beginning to be soft. Add the garlic, stir and cook for about a minute longer. Then add the spices, lentils, and raisins. Give them all a good stir to incorporate the spices well and then add 2 cups of the broth or water. Bring to a boil, then turn down to a simmer, cover, and cook for 30 minutes or until tender. Stir once or twice throughout and add more liquid if needed. Stir in the salsa and cook for 5-10 minutes more. Then taste and add salt, pepper and additional spices to taste. Meanwhile, prep the other ingredients, and spoon the filling and toppings atop warmed tortillas.